One of my go-to presents for a baby shower is to give Homemade Diaper Wipes. 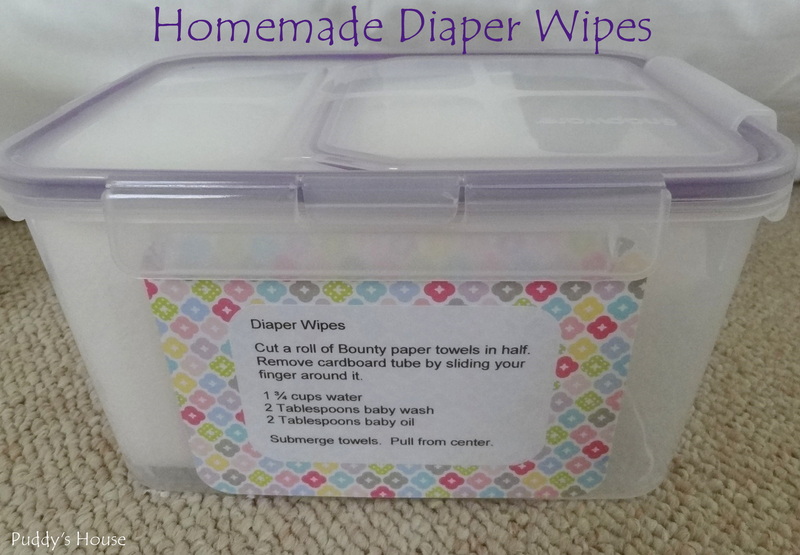 The diaper wipes are simple to make and have gotten many thanks every time I have given them as a gift. It’s really the gift that keeps on giving, because you never have to buy store bought diaper wipes as long as you are willing to follow the simple recipe. The most difficult part is usually finding the right size container. In the past, Rubbermaid made a perfectly sized round container, but not anymore. And, it seems every time I go to make the diaper wipes, I have trouble finding a container. I wasn’t thrilled with the rectangular container I found at first, but in the end it worked quite well. 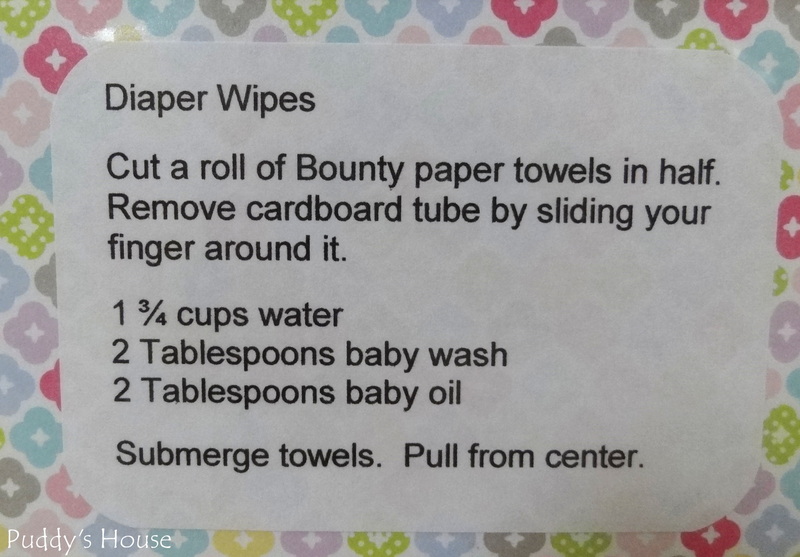 The only supplies you need are a container, Bounty Select-a-Size paper towel roll, baby wash, baby oil, and water. 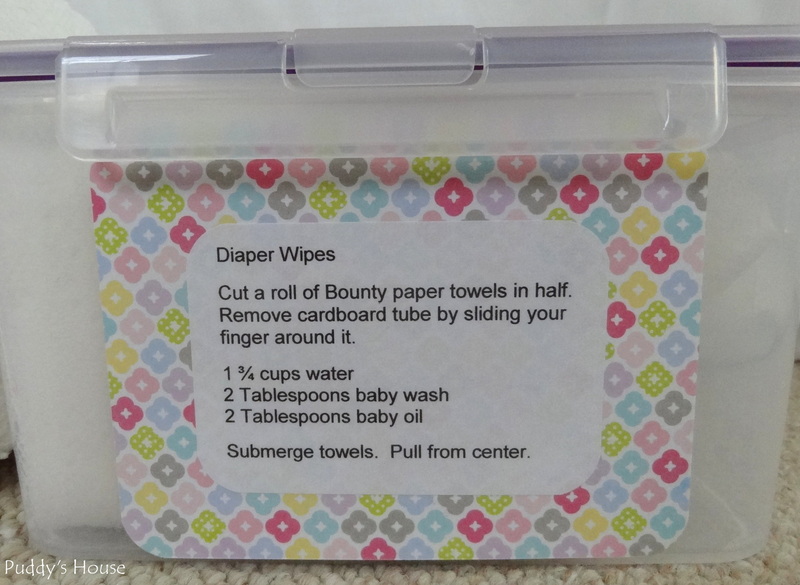 I say Bounty brand because according to all the Mom’s, it is the best brand for the wipes. Select-a-Size rolls are nice, because then you don’t have to waste a whole big sheet each time if it isn’t necessary. You also need a knife. I use a bread knife to cut the roll in half. Mix the water, wash and oil in the container and then as the directions say, submerge the towels (after you remove the cardboard center), and pull from the center. You can change the scent of the wipes, by buying different scents of baby wash. I always stick to the traditional Johnson’s baby wash for the initial gift, because it just smells like a baby to me. For the recipe, I just have it saved in a word document and print it out as needed. I used some scrapbook paper I had on hand, and just attached the recipe to the paper, after I rounded all the corners. Years ago, I bought a package of full sheets of clear laminating sheets. I cut that to the size I needed, place the recipe on the laminate sheet, and attach to the container. This way, the recipe is always handy when you need to make more. I attached it to the side of this container since it was the smoothest surface. I give the Mom-to-be the wipes, along with the supplies, including the leftover half of the paper towel roll. It makes a nice little gift package. Anyone else make homemade diaper wipes? What is your go-to gift for a baby shower? 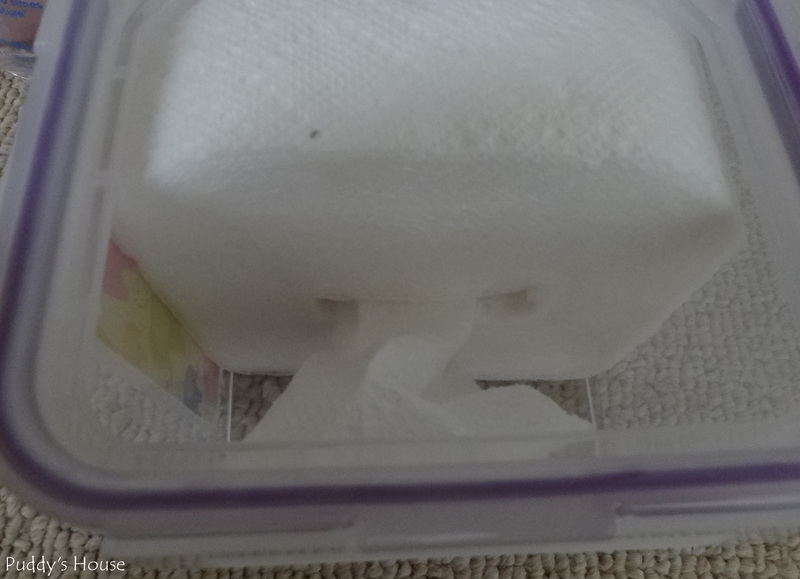 You should mention that moms claim that they clean better than store bought wipes. I didn’t know that!! Good point!